Lawns ― Once your brown turf has turned green, it is time to fertilize on a regular basis. Some warm-season grasses, such as hybrid Bermuda and Zoysia types, like high-nitrogen-based lawn fertilizers. Some turf, such as centipede, needs little or no fertilizer and minimal amounts of nitrogen. Remember high-nitrogen fertilizers always have a large first number in the ratio listed on the bag. Be sure to apply according to label directions to prevent burning your lawn. Pruning ― Once plants have leafed out, it is time to make a final pruning to remove winter damage. Always cut the limb or shoot back to live wood. If the damage to the plant is severe, you might consider replacing it. 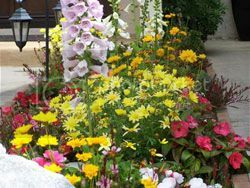 Annuals ― It’s time to finish planting your summer annuals, such as petunias, marigolds, salvia, and impatiens. If the plants are in pots or trays, make sure the roots are not so matted they can’t expand outward into the soil easily. If they are, gently pull the roots apart. This entry was posted on Saturday, May 18th, 2013	at 9:00 am	. You can follow any responses to this entry through the RSS 2.0	feed. Both comments and pings are currently closed.